To commemorate my weekend trip to Prague, I picked up The Castle by Kafka to read. I had booked a dorm bed in Arpacay Backpacker’s Hostel in the Castle district, and it seemed befitting to be reading this particular book by the famous Czech writer. When I came out of the Malostranské metro station, I knew I had arrived in the Prague of medieval times – with stories of torture and tyranny, feuds between religious leaders and scholars – where the cobblestones had seen rain and blood, and the winding lanes had hidden secret lovers and also criminals. As I took the steep road up to my hostel, I was extremely aware of travelling back in time. The Castle loomed above, and when I settled into my room, I just had to look outside the window to see its high walls. I decided to take the first walking tour the next day to learn about Prague. It started in the Old Town Square and proved to be an extremely interesting way to get informed about the city’s history and its role in European politics. The tour guide narrated the story of the Astronomical Clock situated in the Old Town Square at length. The clock had been built in 1410 to show the time, and the moon’s phases, the astrological season and daylight hours. Over the centuries, the clock has been putting up a show every hour. Two figures flanking the clock on each side represent the four fears of the time- narcissism, greed, death and Turkish invaders. When the clock strikes the hour, Death starts ringing a bell and nodding his skeletal head, seemingly saying, “It’s time!” while the other three shake their heads and seek “One more hour”. Death accepts their request and the clock continues to tick until the next hour, when the cycle repeats itself. Legend has it that the Councillors were scared that the inventor of the clock, Jan Ruže, could build another clock somewhere, stealing away the unique status of their city. They invited him to a feast at the castle, but the party was a ruse in order to intoxicate the inventor. Defenceless, they poked his eyes out and cut off his tongue. Blind and mute,Jan R?žethrew himself between the machinery to stop the clock from working. It took another hundred years to repair the clock. I remembered hearing fireworks at the castle last night, with lively music and cheer. Maybe another innovator was being punished for the greed of a few. The castle started looking decidedly sinister, especially from the other side of the river Vltava. All thoughts of villainous authorities and bourgeois societies were put on hold when I sipped on a cool beer at the Lokál, a famous restaurant and beer hall with reverence-inducing wood panelling and the hum of many voices. Once the meal was over, I made my way to the Letná gardens to find a place to read Kafka’s book. In The Castle, the reader learns of K., the Land Surveyor, who travels to a new village, gets hopelessly lost, loses his purpose (and maybe senses), all the while being unable to establish his identity under the jurisdiction of the bureaucratic system, simply referred to as ‘the Castle’. I slipped my book back, crossed the Letná and entered the castle grounds to find a downhill path to my hostel. The moment I entered the gates though, I began seeking a place for myself in the sea of tourists; in the sea of people. I felt utterly alone, and I could not find a way out! I remembered the guide from the morning tour saying that Prague’s castle covered the largest area in the world, and now I was being subjected to a Kafkaesque nightmare. Darkness was falling, and I wanted a bath and a bed, but all I could see were tiny shops along the narrow lanes that abruptly ended at corners. When I did manage to find my way out, I emerged in Malostranské square- my wandering steps had traversed only the eastern end of the castle! Thankfully there was an inviting water pool next to the metro station where one could dip their feet, and I sat there, relaxing my aching legs, and reading something that was most definitely not Kafka. That was how I finished my first day in Prague. The next day I did not go near Kafka or the castle. 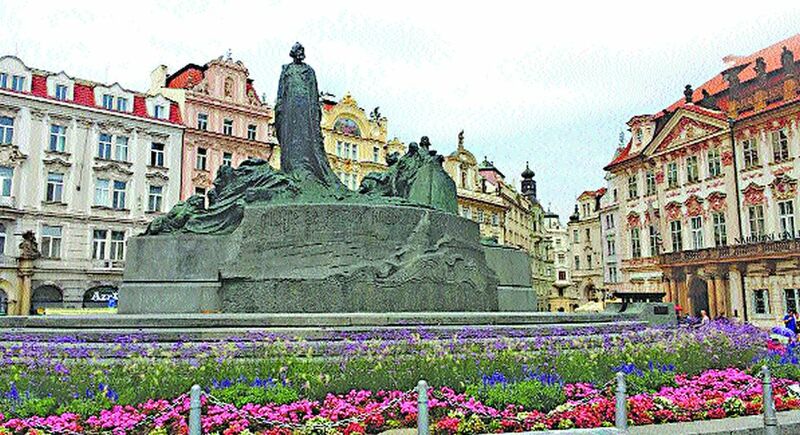 Prague has some lip-smacking cuisine, the best beer in the world, and the Old Town Square was a merry place. I wandered aimlessly in the streets, coming across some quaint architecture, lovely shop fronts, and beautiful potted plants. I traversed the Charles Bridge multiple times. It is a treasure land, with artists and peddlers hoping to make money from happy tourists overwhelmed by the beauty of all that they see around them while crossing the Vltava on a 700-year old bridge. I was happy and overwhelmed alright, but I had no money. I made my way to the National Theatre and marvelled at the statues of composers sitting atop. In their august presence, I played some Indian raagas I knew on a piano kept nearby. It felt incredibly strange! On the last day, I visited the castle early morning. There was an old man playing a merry tune on his violin on the steps leading up to the castle, which looked calm in the benevolent morning sun. The audio guide was for 400 Czech korunas; you could buy 10 pints of beer with that amount, and I obviously chose beer. However, the information boards were quite comprehensive, the interiors were amazing because of their age, and the history and evolution of the castle presented a colourful narrative. There was also a medieval armoury, where war music played, and swords and spears flashed menacingly in the dim light, while empty suits of armour started back. I tried my hand at using a crossbow. Clearly, I wouldn’t have made a good soldier 300 years ago! I had chosen to do the short tour of the main sights of the Castle, and by noontime that was done. I headed down for the last Trdlník, a sweetened bread roll, with vanilla ice cream inside, and as I took the metro and the bus to the airport, I realised that I had left Prague much before I boarded the flight. Because for me Prague was the Castle, the Charles Bridge and the wildly ornate interiors of St Nicholas Church, the trees in the Old Town Square, the winding lanes, and the clock that told a story every hour.